Learning painting from his father, Han Holbein the Elder (1460 – 1524), Hans the Younger carried on his father’s contribution in transitioning German art from the Gothic era to the Renaissance. 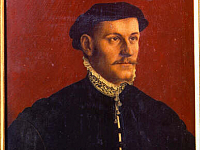 He was also the younger brother of Ambrosius Holbein (1492 – 1519), a painter as well. Hans the Younger his well known for his historically significant contributions, having illustrated satires for the Dutch Humanist of the reformation movement, Erasmus (1466 - 1536), notably Encomium Moriae (The Praise of Folly). One of the best known portraits of Erasmus was painted by Holbein. He also provided illustrations for Martin Luther’s landmark translation of the bible. These illustrations, while masterful, were challenged still by his work of 41 drawings used for woodcuts, The Dance of Death. Holbein completed the works for a book published in 1538, depicting allegories from medieval times. 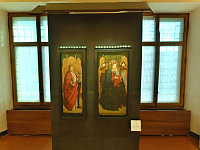 These early works were done while the artist resided in Basle, Switzerland. The Protestant reformation movement was not a profitable time for artists in Basle, prompting Holbein to travel to England in 1526. Here he found patronage in the court of King Henry VIII (1491 – 1547), were he completed portraits of the King, the Queen, Anne Boleyn (1501 – 1536), and his third wife, Jane Seymour (1507 – 1537), among others. Several of his court portraits from this period received much speculation and confusion as to who the subjects were. This includes a work which now hangs in the Uffizi Gallery, Portrait of a Man, which is though to be the English Statesman, Sir Thomas More, who Erasmus introduced to Holbein. The artist painted another well know portrait of More upon first arriving in England around 1527. Another portrait completed from his time in London also hangs in the Uffizi, Sir Richard Southwell. One of his most praised portraits from the court is The Ambassadors, with the famous anamorphic skull centered at the bottom of the painting. While critics have attributed different sitters from the court as the painting’s subject, there is no doubt that the artist’s work is masterful in representation, both human and among the many still life objects within it. One of his self-portraits also survives in the Uffizi Gallery. 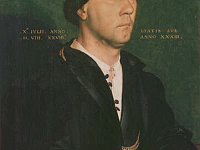 In Holbein’s portrait work he implored the technique of creating pencil renderings of the subject before painting them, many of which are regarded as works of art in themselves. His last piece was an unfinished portrait of King Henry while he was in London. There are also several praised religious pieces from Holbein, including his Oberried Altarpiece and the Passion Altarpiece.